A long-time Racine tradition, Lee's Deli is a favorite among residents of all ages, as well as long- distance customers from as far away as Illinois. You’ll find Lee’s Deli housed in a frame building that was constructed around the turn of the century. The building had been home to several small grocery stores and delis over the years and all have been family owned and operated. In 1961, the business was purchased by Dan and Audrey Bonnar. The Bonnar’s operated the business as Bonnar’s Sausage Shop and eventually Bonnar’s Delicatessen. Bonnar’s Delicatessen operated from the front portion of the building, while the Bonnar’s resided in the rear portion of the building with their family. In 1971, the business was purchased by Leroy (Lee) Neu and the name was aptly changed to Lee’s Deli. It was under Neu’s ownership that the submarine sandwich was introduced, for which Lee’s Deli is now famous. In 1986, three Park High School graduates and friends, John Henes, Jim Dobbs and Steve Hurley purchased the business from Neu and continued offering the same great food that everyone had grown to love. Sub sandwiches are Lee’s specialty , and the one that is ordered most often is the "Gobbler" - a combination of turkey, ham, Swiss and longhorn cheeses. All subs come on a choice of five breads, with five dressing options, as well as lettuce, tomatoes, onions, and/or hot or mild peppers. And the subs are just the beginning. Lee's menu also features a variety of other cold and hot sandwiches, fish and chicken dinners, homemade potato salad, baked beans, cole slaw, macaroni salad and more. Lee’s also offers catering services from sandwich trays to sit-down banquet entrees. While Lee’s has been Racine’s favorite sub shop for years, Lee’s officially won the title “Racine’s Favorite Sub Shop” in the Racine Journal Times first restaurant poll in 2003. Lee’s Deli has won this honor several more times over the years, despite the growing number of national franchises coming on the scene and competing for the sub sandwich business. 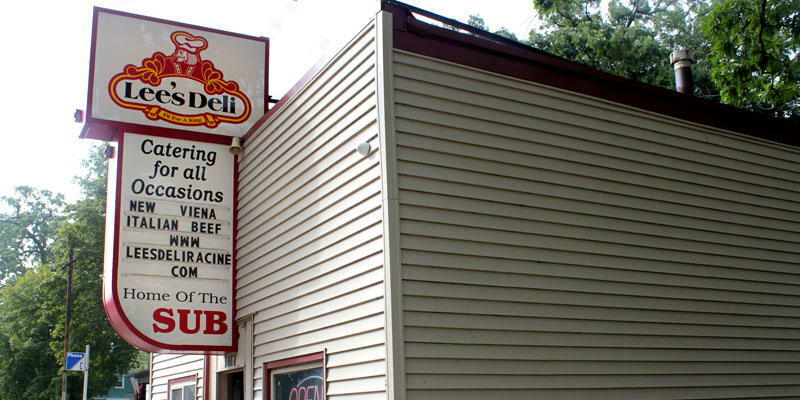 Lee’s Deli has been a mainstay in the Racine community for 40 years. Due to our loyal customers and their faithful support, Lee’s remains a favorite stop for our customers. We offer our customers the great value that they have grown accustomed to, while offering the best tasting subs around. We are proud to continue the tradition of excellent food, friendly service, great value and great taste. Lee’s Deli, proudly celebrating over 40 years of serving the Best Subs in Town!